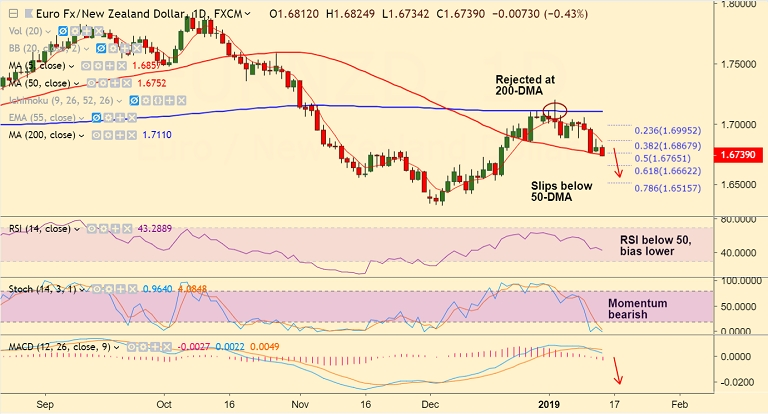 EUR/NZD hovers around 50-DMA at 1.6752, intraday bias bearish. The pair is trading 0.35% lower on the day, momentum with the bears. RSI below 50, bias lower. MACD shows bearish crossover on signal line. Decisive break below 50-DMA likely to see test of 61.8% Fib at 1.6662. On the flipside, 5-DMA at 1.6861 is immediate resistance. Break above to see minor upside. Bearish invalidation only on breakout above 200-DMA.